Don’t miss London Mums’ exclusive chat with Justin Timberlake and Anna Kendrick talking about their Trolls & 80’s Disco. Enjoy! It’s a real treat! Justin Timberlake and Anna Kendrick talk exclusively to London Mums about their Trolls’ characters in the upbeat hair rising colourful DreamWorks’ comedy TROLLS filled with unbelievable adventure and incredible music. 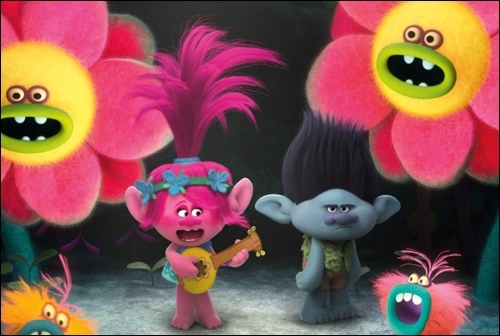 Known for their crazy, colourful, and magical hair, Trolls are the happiest, most joyous creatures ever to burst into song. But their world of rainbows and cupcakes is changed forever, when their leader Poppy (Anna Kendrick,) must embark on a rescue mission that takes her far beyond the only world she’s ever known. 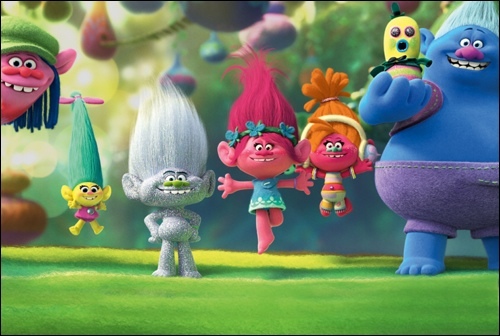 Q: Trolls is a terrific family movie. Justin, was that a big part of why you wanted to make it? And how has becoming a father changed your perception of the world? Q: Justin, you play Branch, the grumpiest troll in the kingdom. How grumpy are you? Justin: I would say that I am like Branch every day for the first hour that I am awake and I don’t have coffee in my system. Q: And Anna, you play Princess Poppy, the happiest troll in the kingdom. Are you a naturally positive person? Anna: I would love to master positive thinking. I am more like an ‘everything is going to go wrong! Everything is going to get ruined!’ kind of girl. There was even a moment where I considered talking them out of hiring me for this. But Poppy is such a fun character. I was really surprised that for a character who is so upbeat and positive she doesn’t get on your nerves. I think that a lot of that has to do with the dynamic between Branch and Poppy. I don’t think that it would be fun to watch either of them on their own for a feature length film, but I think they are really entertaining to watch together. It is kind of like a 1930’s screwball comedy dynamic. Justin: They remind me of The Honeymooners (1955). 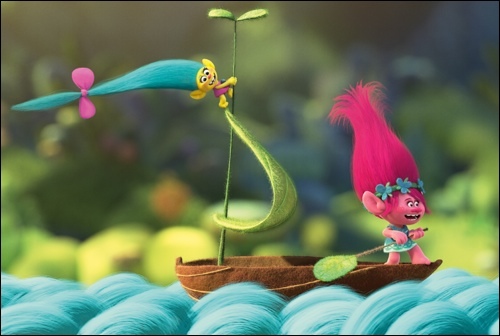 Q: Trolls has created a strong female heroine in Princess Poppy. How do you feel about her? Anna: When the adventure kicks off Poppy is ready to answer the hero’s call. She volunteers herself and has to drag Branch, kicking and screaming along with her. She may be really happy and optimistic, but she is no baby. Justin: Poppy is spunky and tomboy-ish. I have two goddaughters who are five and two and I think that DreamWorks have really mastered an amazing archetypal everywoman female with Poppy. As they did in Shrek with Princess Fiona. Anna: And I do think it’s great that they haven’t assigned her purely male qualities. I mean Poppy loves dresses and she loves pink and you can love all those type of things as a female and also be adventurous and brave. Q: Why do you think there is a trend in animation towards strong lead female characters? Justin: Well, we are trying to raise strong women! I think we all owe it to ourselves to try and do that. And to raise strong humble men as well. I think that DreamWorks has really broken the mould to create a different kind of animated movie with its own DNA. Trolls is a fun psychedelic adventure with all this great music, but it also has a great message. The little girls that see this movie will grow up to become women that are going to run the world. And it is really important that they know that they can like dresses and still play basketball, that they can be President and do whatever it is that they set their hearts on. That is a world I want to live in. Q: Justin, you both star in Trolls and are the Executive Producer of the sound track – was that a challenge? Justin: It was so easy! It had its challenges, for sure, but we had a great team and I will say that having the muscle of DreamWorks behind this made everything easier, because things can get cleared that you probably can’t get cleared normally. Because this is a musical, some of the songs are meant to service the comedy, others are meant to service an emotional lift in the movie, like True Colours. Q: Did you choose all of the songs on the sound track? Justin: Some of the songs were already chosen. However I did end up replacing some of the source songs with my originals, like the one I wrote for Arianna Grande. I think the biggest challenge was Can’t Stop the Feeling, because I have never written a song that is specifically for a scene in a movie before – where a song services the characters and is used to move the plot forward. The other challenge was to make sure that everything sounded both good and cohesive. Because we have True Colours, The Sound of Silence, we have September and we have Lionel Richie’s Hello – luckily, all songs that are in and around the same fifteen years or so years of time. When the movie was described to me at the first pitch, I saw it as the animated version of an ABBA video. I immediately thought of disco, which meant I immediately thought of the Brothers Gibb and Bill Withers and music that came from that era. Music that just made you feel really good. I think people like to dismiss disco music as disposable, but The Bee Gees wrote some of the greatest songs ever. Q: You also rearrange a lot of classic hits by really big artists, did you find that intimidating at all? Q: Anna, if you were singing along to the party mode version of Trolls at home, what song in the movie, would you pick to singalong to? Anna: Probably Move Your Feet. That was one of the first songs that I recorded even before Justin came onto the project. It was a song that I had only ever kind of hummed along without thinking about, but it’s a surprisingly fun song to sing. I didn’t think of it as being particularly within my range as a singer, so I would never have picked it at a karaoke bar. But it is right in the sweet spot where you feel like you are really getting funky. Q: Anna, you are an acclaimed dramatic actress, are you surprised that you have also become a prominent musical star? Anna: I started out in musical theatre when I was 12. But after that I thought of all that as secondary to my career. Like a hobby. I also like to bake, but I don’t do it professionally. So when a musical role was offered I thought ‘I can do that’ because I used to do that. What surprised me was that it wasn’t a one off. It keeps going and I feel very selfish and greedy about it – but I can’t help myself! Justin: You should totally have a baking show. Q: What makes you both happy? Anna: Things that make me happy mostly have sugar in them! Justin: For me the top thing is family – my wife and son and then right under that, donuts! 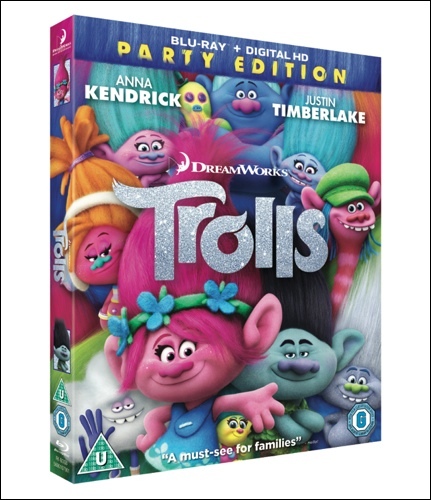 Dreamworks’ Trolls is available on Blu-ray™ and DVD from 13th February, from Twentieth Century Fox Home Entertainment. 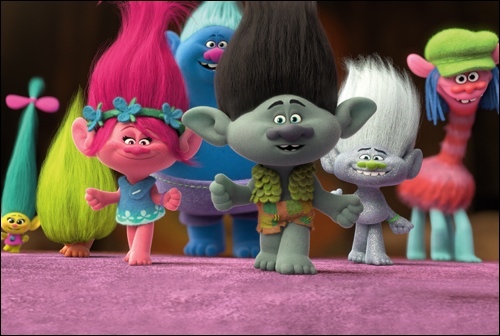 2) Comic Con found their happy place on 21 July 2016 with DreamWorks Trolls as the cast greeted fans and spoke about their upcoming film. In attendance to spread the joy was Justin Timberlake, Anna Kendrick, producer Gina Shay, director Mike Mitchell and co-director Walt Dorn. This entry was posted on Friday, February 10th, 2017 at 2:32 pm and is filed under Movies. You can follow any responses to this entry through the RSS 2.0 feed. Both comments and pings are currently closed.